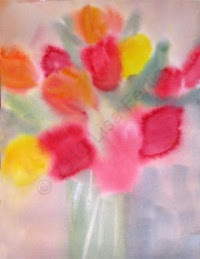 Wet paper with clean water, load brush with Winsor Yellow and indicate yellow tulips. 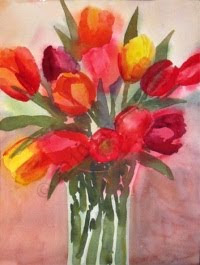 Continue to add Winsor Red with the yellow to make orange and indicate the orange tulips. 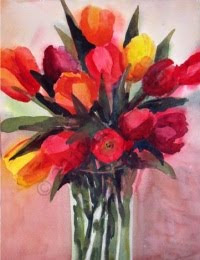 Clean brush and make red tulips with Winsor Red, alizarin crimson and cobalt blue will make your purple tulips. Cerulean blue and Winsor Yellow will be used to show the foliage areas around the tulips and for stem area. The background color is mixed with Winsor Yellow, Winsor Red and cobalt blue in equal amounts. With more water the value will get lighter. Let dry. Using our middle values we will now start to define the tulip shapes, showing a shadow and light side. 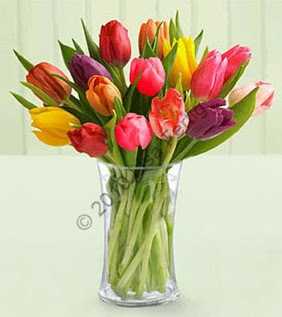 Indicate the stems in the vase with gamboge and cobalt blue, letting the first value show through in areas. Continue to use this green to add leaves between the tulips. Let dry. Our last wash will consist of darker values - Winsor Green and alizarin crimson will be used to make our darkest value. See the value reference to see where those shapes should go on the stems and on the foliage. The vase is made by painting around the vase with a darker value, leaving space for the sides of the vase, to indicate a glass vase.